this is what it looks like from my weenie sized android (galaxy note 3). (03-28-2017, 06:54 PM)Adde Wrote: Never mind I got it. The quotes look nice, very professional. 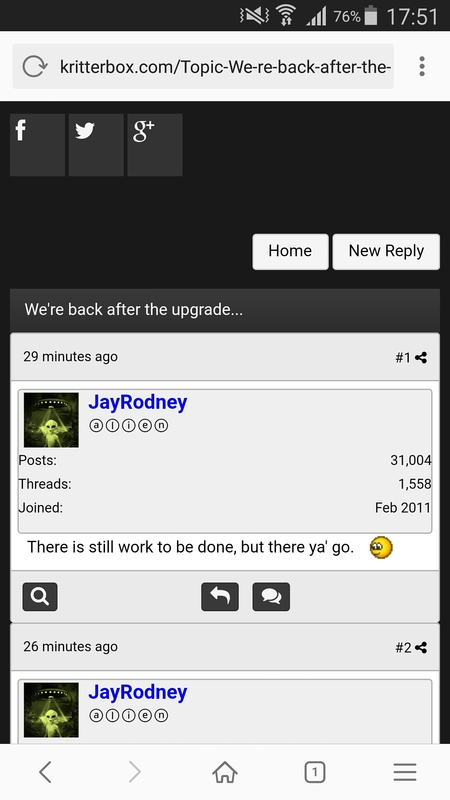 (03-28-2017, 06:24 PM)JayRodney Wrote: A reminder... if you're having problems Ctrl/F5 is your friend. Ctrl/f5 can solve my problems ? These freakin' Hemorrhoids are now DOOMED ! what do I hit for New Teeth ? great jay...just great. 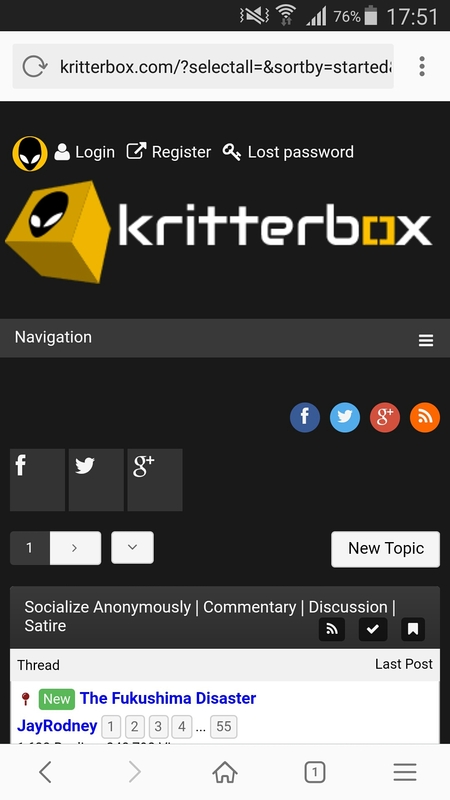 new year, new kritterbox design. (03-28-2017, 08:01 PM)NexusOne Wrote: great jay...just great. new year, new kritterbox design. Very nice and I like the way 'my threads' (in profile area) lists the last post I made for any thread. (03-28-2017, 09:59 PM)UniqueStranger Wrote: Very nice and I like the way 'my threads' (in profile area) lists the last post I made for any thread. There are issues with automedia... the plugin that allows you to embed videos with no bbcode. I'll get with the developer ASAP and get that straightened out. Until then, for videos we'll all have to use the camera and do it the old school way. There are bound to be some odds and ends with a redux of this magnitude, we'll adress it ASAP. When you say 'old' way do you mean...click on youtube icon above, then copy/paste youtube address? Just brushing up on germination because here in Canada it will soon (18 months - - still too long) be legal to use marijuana recreationally and every household will be allowed 4 plants. Now there's something you can grow that birds will love! I hope this serves as an example to the world. Outlawing something used by man so long there are built in receptors in the brain was the real crime. Glad you like the kb changes. (03-28-2017, 10:31 PM)JayRodney Wrote: I hope this serves as an example to the world. I agree, but I heard on the news today that the United States gov't will be giving us a hard time (as was done in the past) because the MJ knuckle-draggers there are still against it.